They're mobile they're relatively cheap and they're practically guaranteed to have a song in their collection to suit everyone - no wonder DJs are so popular at wedding receptions. However, it goes without saying that some are better than others - so how can you be sure of a DJ's quality before he's set up his decks? Follow this guide to find out. A DJ is not just there to play a random list of songs, or even a bunch of tunes you've chosen yourself - if that's all you want it'd be cheaper to hire a jukebox for the night! They'll pick songs to suit the mood of the evening, join them together with flowing patter and make sure there's never a dull moment in the music. However, that doesn't mean the DJ should ignore your wishes entirely. Providing you've hired one to suit your musical tastes, they should readily accept a list of songs you'd like to have played and be ready to take requests from your friends. Bear in mind, though, that a DJ can only play 60 four-minute songs in a four-hour set, so don't produce a list of 100 'must-have' tunes and demand he fit them all in. The best way to find a decent DJ is by seeing them play live. If you hear a DJ at a different event that you think would suit your purposes, ask them for a card at the end of the night. Alternatively, talk to friends with similar musical tastes to see if they know of anyone who might fit the bill. When going through the phone book to find a DJ, make sure you go to see them play live before you commence formal booking procedures. You'll be able to check up not only on their skills with the decks, but on the way they present themselves to the audience. Is their patter any good? Do they interact well with people asking for requests? Is karaoke available as well as straightforward songs? Is there a lot of feedback from the speakers and microphone? Are they dressed appropriately for their event? If they don't meet your standards in any one of these areas, leave without asking for details of availability. Even if you're sold on the live set, it's a good idea to sit down with your DJ and have a chat before rushing headlong into a booking. Of course, seeing a live set by every DJ you're thinking of hiring can be difficult, so you may be forced to interview some without the benefit of such knowledge. There really is no substitute for experience when it comes to entertaining the tricky crowds that attend weddings. Ask DJs how many weddings they've played at before. If the answer is less than ten, make sure this is reflected in the price they're charging - a less experienced DJ comes with a greater risk attached. It's quite possible that a local DJ with plenty of experience will have played at your venue before, so check whether they know it. It'll help when getting there, setting up and with any minor pitfalls associated with the place. Equipment is likely to be well down your list of things to consider when hiring, but it's absolutely vital that the DJ knows how to set up and handle the instruments they're using. Nor is there any point in using cheap equipment in a large venue - you won't get the professional sound quality you're after. Obviously, not everyone is an expert on makes of equipment, so browse a few DJ websites (not brand-name equipment sites) to see what they recommend for professional usage before you ask your own DJ what they use. Professional DJs will have their paperwork in order - lists of CDs with available songs, request forms to fill out and the like may be available to you at the meeting. If not, make sure the DJ at least has the songs you're desperate to hear on the day. You may contact a company that has more than one DJ on its books. If so, make sure the DJ you go to see and like is actually the one who'll be performing at your event when you contact the firm. Ensure the name is written into your contract of employment as well, so there are no mistakes about the person you've hired. 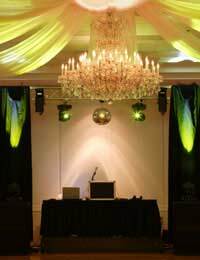 Give your DJ directions to the reception venue and ensure someone will be there ahead of time to let them in and give them time to set up. If you're expecting the DJ to play during dinner as well as afterwards, make sure they know when speeches and the cake-cutting are happening so they've got time to turn down the music. Some DJs may ask to put out business cards advertising their services. It's up to you whether you allow this, but if you don't want it, make sure they don't do it. Once your DJ's played for their allotted amount of time, make sure you reward them adequately - and we don't just mean with their fee! Offer them a drink and set aside some food so they can eat after their set. Even if they refuse, you'll have made it clear how much you've valued their services by offering to feed them. Finally, don't be afraid to shop around to find a DJ you really trust to deliver a great night. It's worth spending time - and possibly a little extra money - to make sure your reception's night to remember rather than a disaster on the dancefloor.